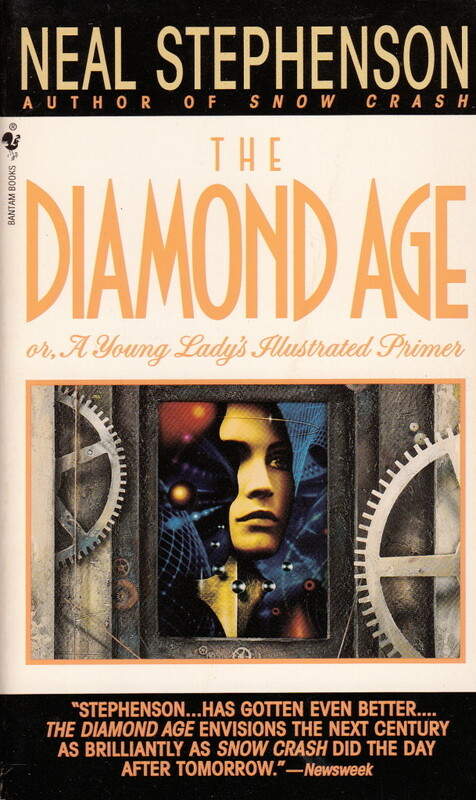 The Diamond Age is a classic from 1996 (that feels so wrong to type – I was in college, for chrissakes). It’s a story about the future and a special kind of book – an electronic book before there were kindles or nooks or iPads. This is a book that helps a child learn. It’s personalized to the child – figuring out what they know about both academics and the world around them. It teaches these children how to function in the world, and the goal is not just to make them book smart, but also to give them the drive and the ability to succeed as things change. And not just react to that change, but create the change. Three bespoke versions of the book are made: one for a wealthy man’s granddaughter, one for the inventor’s daughter, and one that gets lost and ends up in the hands of a street urchin named Nell. They change the world. Disclaimer: The Diamond Age has been my favorite Neal Stephenson book since I first read it. I may have read Snow Crash first, but I like this one more. Why? There’s the obvious: I’m female and I love reading. I’m generally tech-optimistic, even if I have doubts about our current technology. A sci-fi book about education and reading with women in primary roles? Sign me up. But I also love it because of the world it creates. The characterization of China was off – Stephenson missed China’s meteoric rise over the last 20 years – but the Vickys (the neo-Victorians) and the other various sects play well together. And I can see a neo-Victorian strain in Silicon Valley, with its insistence on perfectibility – if we could only do x or figure out y, then we could make everything perfect! It is a classic. Read it if you haven’t.